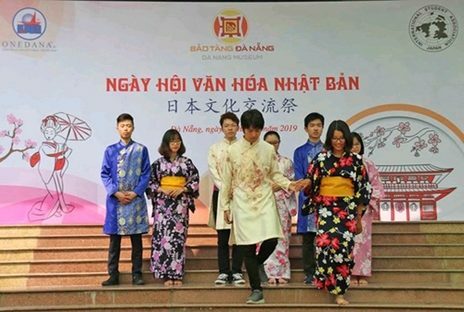 The Da Nang Museum on March 10 held the Japanese Culture Festival 2019 in the central city of Da Nang. The Da Nang Museum on March 10 held the Japanese Culture Festival 2019 in the central city of Da Nang to popularize the beauty of the culture, land and people of Japan to locals and visitors, thus contributing to the strengthening of cultural exchange between the two countries and bilateral friendship. Large crowds of participants had a chance to enjoy shows and join various activities related to Vietnamese and Japanese traditional costumes, quizzes on the two cultures. They also showed special interest in Japanese typical food, tea ceremony, calligraphy, paper folding, and folk games. In Vietnam, Japan is often referred to as “the land of cherry blossom” or “the land of rising Sun.” Many of its cultural pieces such as kimono dress, ikebana flower arrangement, cherry blossom, samurai fighters, manga books, sushi and sashimi are very popular among Vietnamese, young and old alike.